The plateau in the Grand Canyon is covered for miles with this low shrub, which gives the landscape its characteristic pale desert coloring. 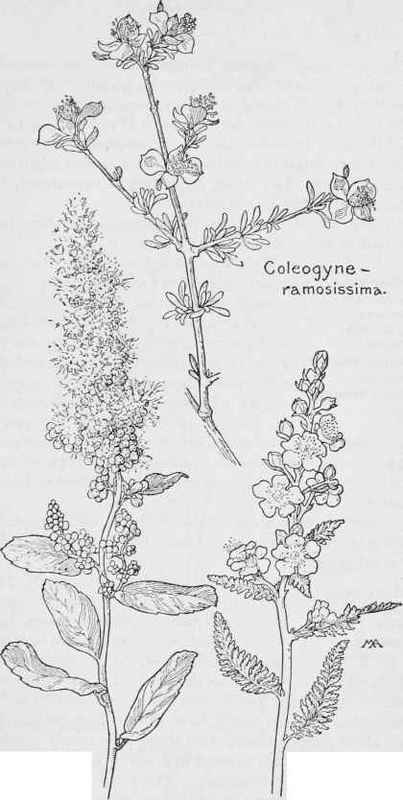 The flowers, over half an inch across, with one or two pairs of three-lobed bracts at base, grow singly at the tips of the twigs and, unlike most of this family, have no petals and only four, spreading sepals, bright yellow inside, two of them pointed and the alternate two more round in shape. The ovary is enclosed in a yellow, hollow, urn-shaped receptacle, surrounded by numerous stamens inserted on its base, the yellow anthers with threadlike filaments. Hardhack. Spiraea Douglasii Fern-hush. Chamaebatiaria millefolium. ROSE FAMILY. Rosaceae. The very small, narrow, toothless leaves are evergreen, leathery and stiff, opposite, grayish in color and imperceptibly downy, clustered in small separate bunches along the rigid twigs, which are set almost at right angles to the reddish-gray branches and rather swollen at the joints. The whole shrub is from two feet to four feet high, stiff, almost thorny, and rather forbidding in appearance, but the odd little flowers are pretty. There are several kinds of Argentina, differing from Potentilla in the leaflets and the style.